Yume-Neko Smile -- still dreaming, still smiling, and still a cat (sort of). Meow. Dreaming of owning a pony, but anxious about taking on the necessary responsibilities? Fret no more, there's an alternative. By the end of the year, Sega Toys will begin selling a life-sized robotic pony. The 1.2-meter tall, battery-operated Dream Pony (Yume-Kouma) is outfitted with sensors that enable it to react to its environment. Pet the pony's neck and back and it shakes it head and moves its ears and tail in appreciation, just like the real deal. Dream Pony also responds to audio and visual stimuli with a whole repetoire of reactions -- including an anxious-sounding whinny when the room becomes dark and a jerk of the head in response to a sudden loud noise. 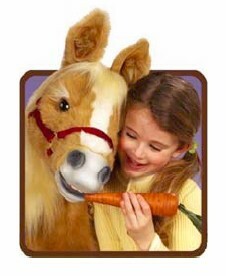 Dream Pony also comes with a plastic carrot that it attempts to eat when held in front of its face. Unfortunately, though, Dream Pony lacks the appeal of a real pony primarily because its legs do not move. (Come on, what do you expect for 68,000 yen/$US600?) No moving legs means no joyrides through the hood, so you can cross it off your list of alternative modes of transportation. But as long as you weigh less than 36 kg (80 lb), the pony should be strong enough to support your weight. Dream Pony, whose sales are expected to reach 10,000 units per year, is the latest beast in Sega's Dream Pet (Yume-Petto) series of virtual pets, 800,000 of which have been sold to date. Another of Sega's recent mechanical pets is the popular Dream Cat Smile (Yume-Neko Sumairu), previously known as Near Me (Nyaa Mii is a Japanese play on words mimicking the sound a cat makes). There is a fantastic video (.wmv) on the Near Me homepage (near the bottom) that is worth a look. Another video of Dream Cat Smile can be found on YouTube here. 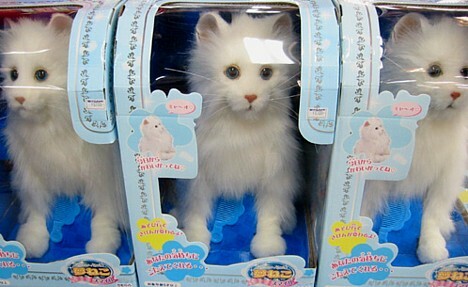 The fluffy white feline is priced at just over 8,000 yen (US$70). Sega Toys has made significant progress in carving out a market for alternative pets for families unable to keep real animals, and the company is now developing virtual dogs and birds to capitalize on the rising demand for "healing" pet robots. Blade Runner, here we come.